One of the top online selling sites, Flipkart brings unlocked SIM free version of Motorola RAZR in India. It’s already in there stock. You just need to spend Rs 33900 ($696) for buying it with one 1 year manufacturer warranty. They also offer Galaxy Note in India for Rs 34,990 ($696). But it is not available yet. I am also pretty sure that sometimes in November Samsung Galaxy Nexus will also be available in India. So it really becomes very hard to choose your next smartphone. Check this link to see the Motorola RAZR XT910 offer in India. Flipkart is also making free delivery at home inside India. 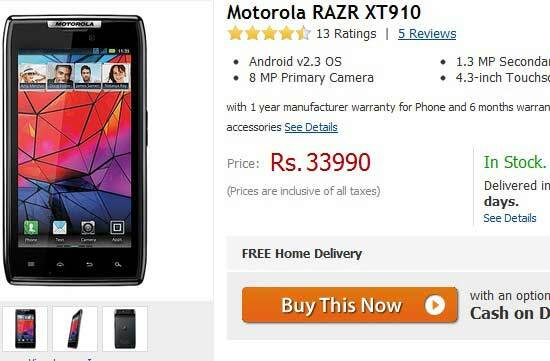 *Update: Letsbuy is now also offering Motorola RAZR XT910 at a cheaper rate. There price is Rs 500 less then Flipkart, Rs 33,499.